Browsing through my copy of Mythic Locations, I noticed that Mark Shirley’s Chapter 11: The Wolf’s Court is set in the Gevaudan region of Provencal. The area suggested as the default location is centred on the bishop ruled town of Mendes in the east of the region and includes the southeastern portion of the Massif Central and the forested gorge of Tarn River. The chapter is a great piece in it’s own right due to the anachronistic local legends (see the Beast of Gevaudan, made famous by the 2001 French film, Le Pacte des loups or “The Brotherhood of the Wolf”) but I’m mostly thankful it has drawn my attention to the area from a meta-game perspective. So Gevaudan is a great spot to develop for a number of reasons, but I’ll admit my interest is mainly because there’s nothing much detailed for this area in the official supplement, Faith and Flame. 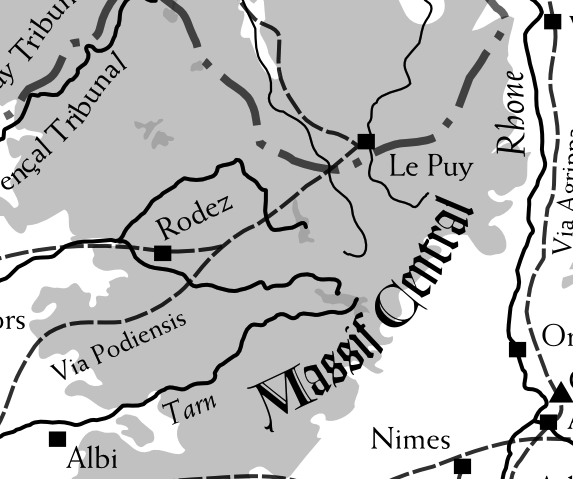 Although not intentional, the gazetteer component of the Provencal Tribunal supplement does not detail this fringe area much as not only does the Massif Central region of Mythic Europe fall on the border of Normandy and Provencal, but the hills are found at the edge of the eastern Toulousain, the northeast of the Narbonnais region and over the Rhone from my Arelat section. As such, none of us (CJ, Ben and I respectively) detailed the area specifically- perhaps this could be seen as an oversight, but I’d like to think of the lack of official development as an opportunity to explore some ideas prompted by Mark’s piece and would propose the region as an excellent place for a player character covenant. 1) There is a forest. There are hills. There are most likely faeries (or at least supernatural creatures). The basic “castle-on-the-hill-by-the-faerie-wood” covenant trope (see ArM5 Covenants, page 7) is therefore satisfied ie. the area provides a vanilla if somewhat unimaginative covenant start in one of the heartland areas of Mythic Europe, as represented by the “Spring in the Woods” Covenant Situation presented on page 26 or ArM5 Covenants. That’s OK, one of the explicit design goals for Provencal was to make it “vanilla” in the sense that it represented the default Hermetic culture of the ArM5 corebook to allow for ease of play, particularly by new Troupes of players (see Timothy Ferguson’s related post on the value of vanilla settings). 2) The somewhat isolated area has no established Hermetic presence – the closest “official” covenant is the Normandy covenant of Atsingani, a vassal of the Tremere led Great Liege, Montverte (see page 76-78, The Lion and the Lily) that wanders the lands to the northwest. The region is also at the fringes of the influence of the Coenobium based along the Rhone in Arelat. This makes it far enough away to escape notice of established Normandy or Provencal factions for long enough for the characters to establish a Spring covenant with it’s own history and personalities without unnecessary interruption by rivals. If required, the characters of a newly settled covenant in Gevaudan can ignore much of the material regarding the contentious upcoming Provencal Tribunal Meeting of 1221, greatly simplifying the initial years of play – the Redcaps of the Coenobium just don’t start showing up until a few years into the Saga. Alternatively, if the Troupe want to incorporate more established Hermetic elements, a Coenobium sponsored chapter house in the region or a Tremere led expedition (perhaps as a replacement to the ill-fated Lariander of ArM3 Covenants) may make a good backstory for a motley collection of young magi seeking to find their own way in the world. These options provide developed links to powerful allies and the potential to become embroiled in more political stories from an earlier stage. 3) Similarly, locating away from powerful nobles or the influence of the Church allows as much or as little specific Provencal or general Hermetic culture to be introduced as the Storyguide desires, much like the function originally served by the Val du Bosque of ArM3, but without the obligatory interruption of the Albigensian Crusade (although perhaps accomodating some of the fallout of the recent war). The local lord, the Bishop of Mendes can be developed in time as an ally or perhaps as a worthy antagonist using the ideas presented for Bishop Orris in the Antagonists supplement. 4) The woods and hills provide an easy means to introduce mundane, Faerie and Magic creatures familiar to most players from European folklore and medieval stories. As Sara Maitland notes in her book “Gossip from the Forest”, the majority of European fairy stories are set in or involve a forest, so a default forest location allows the Troupe to draw upon existing motifs from the core canon with relative ease compared to the more peripheral Tribunals such as Thebes or the Levant. It’s too late in the month for me to detail a starting covenant for a November NaGaDeMon style project (see Timothy’s Covenant of Sabrina’s Rest project from last year as an example) and I don’t have the time to flesh this concept out further but I think it’s a worthwhile addition to the Provencal supplementary material I’ve already collected. Addit: although terribly anachronistic, the Beast of Gevaudan legend (see this short film) and the Le Pact des Loups fantasy film are so laden with Story Seeds and ideas that could be readily adapted to ArM5 that I’ll probably attempt writing some material on it. One of the core concepts driving the design of the Arelat chapter of Faith and Flame was the wake of the depradations of Fraxinetum. This little known but fascinating episode from real history was a great hook and I felt the concept required at least some treatment in any Provencal Tribunal book. I had just finished writing material for The Cradle and the Crescent at the time, so working on some ideas for a Moorish raider covenant came fairly easily. So Ben MacFarland (one of the US based ArM5 line authors) presented the authors of Faith and Flame with a bit of a present today – he used his Google Glass to record the “unboxing” of his newly arrived copies and flicked through them slowly so the non-US authors (CJ and me basically) could have a look at the artwork. You can’t see the actual text clearly so it’s apparently legit from Atlas Games’ point of view but you can make out the layout. I’m very thankful to Ben for his efforts – simply put the maps (by Matt Ryan) are amazing and I particularly enjoyed the artwork in my Arelat chapter. Good to see some new interior artists and I particularly liked the Lou Carcohl by relative newcomer Christian St Pierre (who was responsible for the lovely “Siege of Mistridge” piece that graces the cover). Go see the dedicated “Faith and Flame” thread over at the Atlas Games Forums for more comments as we continue to discuss the supplement. One of the major concepts I worked on for the Arelat section of Faith and Flame was that of the allied hedge wizard herbalists of the Coenobium, the so-called “Masques of the Coenobium”. This concept was eventually watered down to an insert of the same name, the Pralician character Lavandarius and some details on Lavender of Virtue. Lavandula or lavender is such an iconic symbol of modern Provence that I wanted to be able to include it somehow in the Arelat section but without it being too anachronistic. 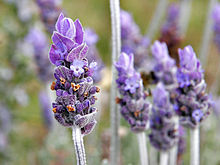 This attempt lead to a whole lot of research into medieval herbalism, the reputedly magical classical properties of lavender in ancient Greek medicine and investigation into the local folk magic of Provence. As I’m a unabashed “hedge magic tragic” from way back, some sort of allied collective of subsidiary Cunning-Folk / Folk Witch style herbalists seemed a logical concept to develop further, particularly for a covenant like the Coenobium where the Jerbiton magi style themselves as living in good taste (hence the perfumes, fine pastries, sauces and spiced wine) and the Redcap contingent has need for a plethora of useful minor magical items. I’ve just posted the first supplemental material for Faith and Flame over at the relevant page. Originally the Redcap Sicart the Leper was intended for inclusion in the book as a potentially ally of new characters, but I didn’t feel comfortable statting up various Companion characters initially (I hadn’t written my “Training Packages for Redcaps” article yet). I then ultimately ran out of time. So while digging through my old material I came across a partially completed article on various concepts useful for playing Andalusian Magi. I’d long lamented that much maligned ArM3 Tribunals of Hermes: Iberia contained a woefully inadequate amount on Granda and in truth basically no material on Islamic Hermetic Magi. I therefore decided to address this but never finished the piece. Seemed a shame to waste such good ideas and given there appears to be no chance of a revised Iberian Tribunal anytime soon, I may as well dust them off and showcase them here for general use. Some of the ideas and concepts may well be useful for Sagas set in the Mythic Levant or the Mythic Middle East and may provide interesting material for opponents or allies of characters located in the nearby Provencal Tribunal. 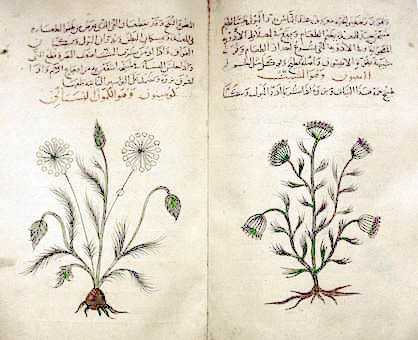 The original ideas for some of the more developed concepts appeared in my old Sub Rosa article “Dar al-Nujum Covenant”, the complete text of which is now hosted on this site. Faith and Flame has been forged! So my third supplement is finally off to the printer according to the Atlas Games website.